implement the Namibian School Feeding Programme. Education in Namibia faces challenges at the national and regional levels. National challenges include a shortage of skilled workers, for example qualified artisans, technicians, engineers, medical doctors and researchers; high unemployment levels among secondary and tertiary education graduates; and an inefficient use and distribution of resources as well as a general shortage of books and instructional materials. At the regional level there are concerns regarding teacher competence and parental involvement in children’s education as well as a growing concern about the quality and efficiency of education delivered triggered by poor performance in schools. National and regional continuous professional development units are being introduced though again this is proving challenging. Among the initiatives implemented to improve educational quality and lead to greater inclusion are the Education and Training Sector Improvement Programme (ETSIP) and the National Standards and Performance Indicators for Schools in Namibia (NSPISN). NSPISN is aimed at improving quality teaching and learning at individual schools. The programme ensures that each school continuously evaluates its own performance and identifies aspects that need improvement. ETSIP is aimed at improving the quality of education by responding to the call of Vision 2030 and facilitating the transition to a knowledge-based economy. The programme is phased in at three five-year cycles, coinciding with the National Development Plans. The sub-sectors and strategic objectives of ETSIP are distributed over the 15-year ETSIP Strategic Plan, the first phase of implementation taking place 2006–11 and the second and current phase of implementation 2012–16). The programme includes critical cross cutting issues that are mainstreamed into the key sub-programmes and cover the themes of ICTs, HIV and AIDS, and capacity development. The main challenges of ETSIP were monitoring and evaluating progress as well as ensuring the effectiveness of the training approach. However, observations and inspections of schools and classrooms demonstrated that teachers had become more positive towards teaching and learning following the initiative and parents had become more committed and supportive towards both learners and teachers. The principal tertiary institution is the University of Namibia, established in 1993, with its main campus in Windhoek and nine other campuses across the country. The university offers courses in agriculture and natural resources, economics and management sciences, education, engineering and information technology, medical and health sciences, and law. There are also a polytechnic, technical and agricultural colleges, and four national teacher training colleges. 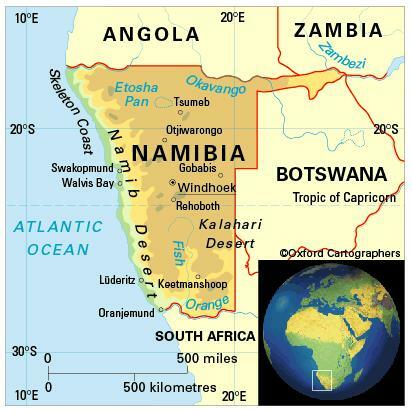 Namibian College of Open Learning provides open and distance learning. The female-male ratio for gross enrolment in tertiary education is 1.3:1 (2008). Literacy among people aged 15-24 is 93 per cent (2010). There are extensive adult literacy programmes.